With outstanding versatility and performance, the Canon imageRUNNER ADVANCE IR 4035 model meets the needs of workgroup or enterprise office environments. This digital monochrome model rapidly scans, prints, copy, fax and distribute documents with precision and ease. Advanced management tools and multiple in-line finishing options help produce professional documents with ease. The Canon imageRUNNER ADVANCE IR 4035 4035 model features a range of collaboration tools, streamlined one-step operations for complicated tasks, and the power to perform multiple jobs concurrently. The Canon imageRUNNER ADVANCE IR 4035 model delivers output speeds of up to 35 ppm in black-and-white, and scanning at speeds of up to 51/51 ipm (simplex, 300dpi, BW/Color). Offering standard Color Universal Send, UFR II Printing, and a range of paper handling and finishing options, the Canon imageRUNNER ADVANCE IR 4035 model is intelligent value at its best. Advanced imageCHIP system architecture uses two processors to deliver outstanding multitasking performance. Large embedded control panel provides easier viewing. Two menus streamline your workflow. The Main Menu gives you instant access to system functions, while the Quick Menu powers productivity by allowing you to combine and access routine tasks at the touch of a button. A universal design that's not only appealing to the eye but also easy and comfortable to operate. Soft curves and natural soothing color palette create harmony between innovation and your work environment. 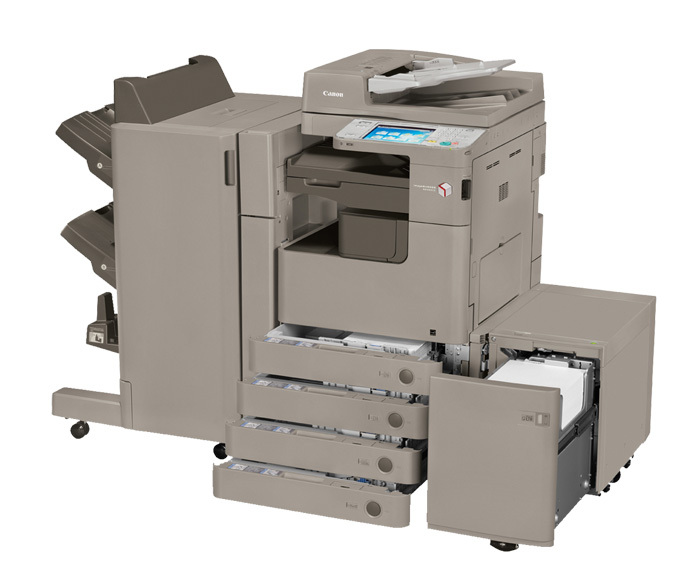 Rapidly convert paper documents to digital files with the 100-sheet capacity, auto duplex document feeder with color scanning support at speeds of up to 51 ipm (simplex, 300 dpi). A choice of modular in-line accessories makes it simple to produce professionally finished documents, including a choice of a staple finisher or booklet finisher, both with 50-sheet multiposition stapling, 2/3 hole punching, and an internal finisher with optional 2/3 hole punching. Advanced Box, Canon's new built-in document sharing solution enhances the ability of multiple users to collaborate. Files can be stored in Advanced Box shared folders and accessed from multiple locations including a PC or other networked imageRUNNER ADVANCE systems. Whether from the imageRUNNER ADVANCE model or at your own desk, you can have direct access to the functions that make your work easier with the imageRUNNER ADVANCE Desktop utility. The Workflow Composer utility reduces multi-step and frequently performed operations to the touch of one button that can be placed on the Quick Menu. Universal Send provides an expanded range of file formats including High Compression PDF/XPS, Adobe PDF Reader Extensions, Searchable PDF and Encrypted PDF. Transform the way you access files with Canon Cloud Portal for imageRUNNER ADVANCE. Connect directly to Microsoft SharePoint Online or Google Docs cloud services without the need for extra hardware or software. 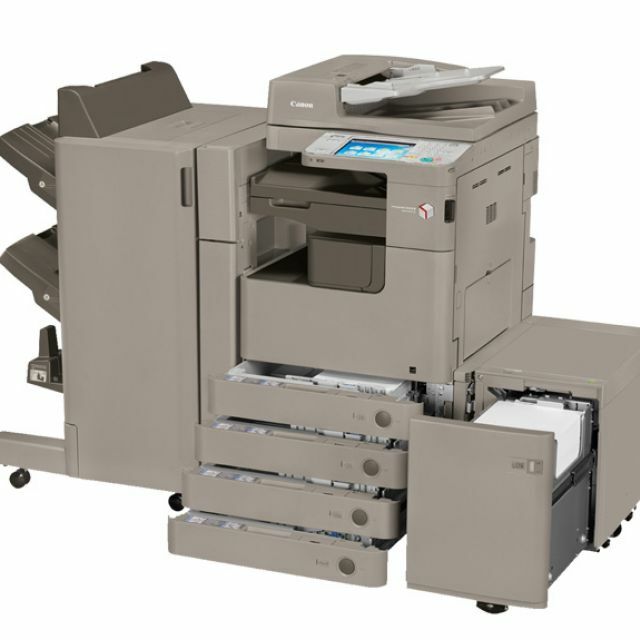 Canon's UFR II print technology is standard with this model, optional Adobe PostScript 3 and PCL 5e/6 are also supported. Scan to or print from a USB thumb drive or optional memory media. - Enter data more comfortably with the optional USB keyboard. Canon offers a number of security features for document security, data security, mail server security, logging/auditing security and authentication. Access Management System allows you to limit device access by user, group or role and you can even limit access for only specific functions such as Send. With Document Scan Lock and Tracking you can embed hidden tracking information in a document to restrict unauthorized copying or scanning and to track the origin. Adobe LiveCycle Rights Management ES 2.5 Integration protects access to documents throughout their duration. After documents are scanned, specify security policies and select authorized recipients. The Trusted Platform Module allows you to safeguard vulnerable settings such as passwords with a new security chip featuring tamper-resistant hardware. Disguise information before it's written to the hard drive, and permanently remove it by overwriting when the job is complete with data encryption and erase options. The Remote User Interface gives you centralized control for any individual device right from your desktop, so that you can check supply levels, monitor jobs and stay completely informed. The imageWARE Enterprise Management Console offers one central point of control for all systems across your organization. This web-based utility makes it easy to install and manage multiple Canon and third-party networked devices. The imageRUNNER ADVANCE Series makes it easier to track, manage and influence user behavior. From analyzing color output by employee or client to encouraging double sided printing, you can ensure that resources are employed optimally and costs are allocated accurately. Reduce costs and increase performance with the ability to streamline your workflow. Outstanding image quality for striking results. Retrieve information from other imageRUNNER ADVANCE models on the network to help eliminate extra hardware or to easily collaborate. Reduce downtime with the ability to replace toner on the fly. If incorrect paper size or stack for a job is unavailable, the system can begin the next job without delay. New level of connector and link support through Canon's innovative MEAP platform. With 1200 x 1200 dpi print resolution produces fine lines and crisp text, even at small font sizes. Innovative technologies, including Canon's QF toner, produces clear, detailed images with a smooth, high-quality finish. Canon's life cycle assessment system helps to reduce C02 emissions by focusing on each stage of the product life cycle, including manufacturing, energy use, and logistics. Compact with less packaging for efficient transportation. Designed with recycled plastic and bio-based plastic for certain components. The combination of Canon's fusing technologies and QF toner helps reduce overall energy consumption by minimizing heat and power requirements. Power consumption for sleep mode is 1W or less. Meets and exceeds ROHS directive.